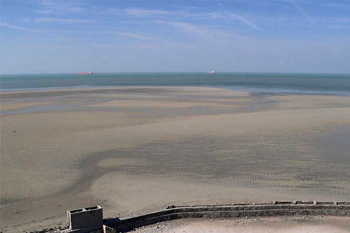 In the Gulf of Kutch, Pirotan Island is one of the 42 islands which compose the Marine National Park. India's first national marine park comes under the Jamnagar district of Gujarat. The park gives an opportunity to witness the coral reefs, mangroves, incredible aquatic creatures and beautiful variety of birds in the unruffled setting of nature. Pirotan lies 12 nautical miles off the coast (Bedi Port) and stretches up to 3 sq km. There are two islands from the 42 which can be accessed by general public; Pirotan Island is the most popular one. Narara is the other island out of the two; it can be reached by road to see the birds, corals and other aspects of the marine life. Before coming to Pirotan one needs to follow a strict official procedure as per which the permission of Forest Department, Customs Department and the Ports needs to be taken. In case of a foreign national, an additional permission from the Police Department is required. Attractions This extraordinary national park will take you to another world and give you a glimpse of the extraordinary life under the salty waters of Arabian Sea. The beautiful birds such as pelicans, herring gull, sea gull, black-headed gull and various kinds of waders offer delight. Incredible marine animals like jelly fish, octopus, star fish, sea snakes, hermit crabs, sea horse, sea slugs, green sea turtles and dolphins might just bless you with one of the lucky days of your life. Coral reefs and marine vegetation (mangroves and various flowering plants) will take you under the depths of ocean without even wetting your fingernails. Pirotan was originally known as 'Pir jo thaan' signifying the sacred place of Saint Khwaja Khizer Rahmatullahialaih. The holy shrine of the saint is also located at the island. How to Reach Regular ferry service up to the Pirotan Island is not available. A boat needs to be hired from the port that will take about 1.5/2 hours to reach the island. Being a shallow beach, the boat can reach and leave the island only at the time of high tide. The tide timings need to be enquired as they tend to change with the change in the position of moon. High tide usually has a cycle of 12 hours, so once you reach the island, you probably have to spend 12 hours on it. Important: There is no place to stay, no food and no water at the island. The tourists should bring their own food and water as they will have to stay at Pirotan for about 10/12 hours waiting for the high tide to come.